This is my first indulgence cooking with it, whom am I referring to? Its none other than Butternut squash. It is a winter vegetable and comes from the gourd family. It has a hard, thick skin and it is filled with seeds. It can range in size from 8 to 12 inches long, and about 3 to 5 inches wide, weighing up to 3 pounds. The color of the Butternut squash ranges from a yellow to a light tan. Inside, the flesh is orange and has a sweet flavor. Available in early fall through winter, you will want to choose a squash that is heavy with few blemishes and moldy spots. Storage: Butternut squash can be stored longer than summer squashes because their skin is so hard and thick. Store in a cool dry place for at least a month. If the squash has been cut into pieces, then wrap in a plastic wrap and refrigerate up to 5 days. Nutritional Qualities: The following qualities are available in one cup of mashed squash: 80 calories, 2 grams protein, 1 gram fat, 18 grams carbohydrates, with riboflavin, iron, Vitamins A and C.
Preheat oven to 400°F [200°C]. Cut the butternut squash into half and peel it with a knife (do not use peeler, it tough to work with). Cut into bite size pieces or you can use ready made store brought. Toss with extra virgin olive oil, kosher salt, rosemary, balsamic vinegar and freshly ground black pepper. Spread them single layered either on a cookie sheet or large dish. Roast until squash turns soft and lightly caramelized about 40 minutes in the oven. Remove from oven, toss it with 1 teaspoon of balsamic vinegar, freshly ground black pepper and kosher salt. Serve hot. Kalyn says "This is also excellent made ahead and reheated. For a holiday like Thanksgiving where there are lots of demands on the oven, it could be cooked early in the day and kept warm in a crockpot while other things bake"
Thanks Kalyn for this wonderful recipe, both of us enjoyed eating it hot and on next day too! This makes a great side dish for Thanksgiving! 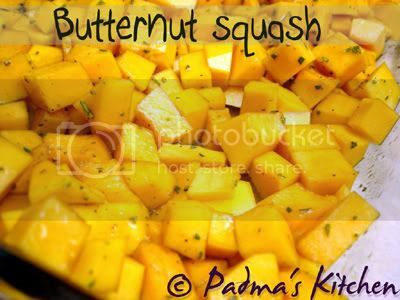 I never cooked the butternut squash but ur pict is really tempting me to give a try :) Is it sweet the veg? Delicous looking dish. this is something i should try out... i only make soup with butternut squash and recently tried the curry. I like soup a lot and will put it in my blog next time I make it and the curry was ok. 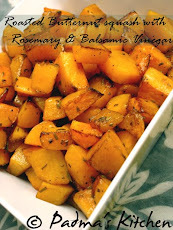 This looks so delicious and it is a nice fall side dish! Looks gr8 yaar. I never cooked. But, seeing ur's, I wud want to give it a shot. Hi there, just discovered this and your photo of the squash looks just wonderful! So glad you liked it. Excellent. We included this in our Thanksgiving menu. The squash is sweet enough on its own, so the use of balsamic vinegar was a lovely alternative. I just made this and I can't stop eating it. I wanted to have leftovers for lunch tomorrow, but...Thanks for the recipe. Rosemary is a flavor my mom used often... paired up with balsamic vinegar this squash must taste amazing, and very beautiful, too! Yummers! Can't wait to try this recipe!! What made the dish delicious? It is because of its natural sweet flavor and because of the herbs and spices found in your spice rack. It is really important to have a spice rack your kitchen because sometimes you become confuse where to get the other spice. You need to have one to organized your spice and your kitchen. That looks simple yet amazingly full of flavor! Really a good recipe. and if you try to add a little balsamic vinegar? Yummy! Thank you for sharing this recipe. I will try this at home. By the way, what brand of balsamic vinegar did you use? Tried this last night and it was excellent!! All other recipes add sugar and this squash has it's own sweetness and we used a fig balsamic for a little different twist...was wonderful. thanks for the recipe, it's going in my must have database!